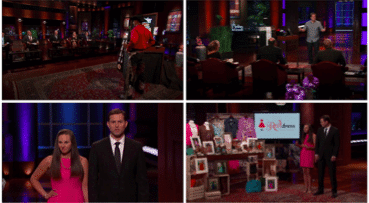 What’s the secret to the perfect Shark Tank pitch? 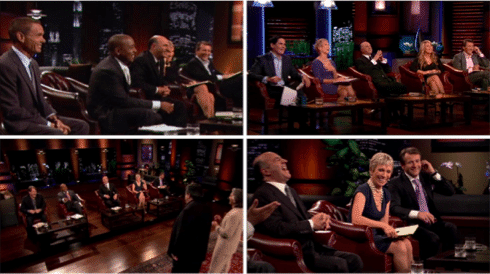 At the Science of People, we decided to find out by analyzing all 495 entrepreneurs in Shark Tank episodes. Of these 495 entrepreneurs—253 of these teams got deals and 242 did not. We analyzed each and every one of the 495 pitches looking for patterns. We found there were distinct—and learnable differences between successful and unsuccessful entrepreneurs. This report outlines exactly what we can learn from the ‘yes’ deals and what we want to avoid from the ‘no’ deals to make our own pitches more effective. What do the sharks look for in a pitch? How about in an entrepreneur? 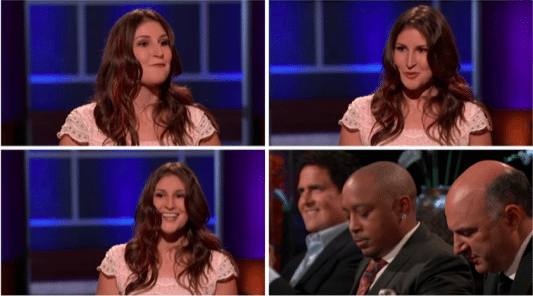 It turns out the success of your deal on Shark Tank isn’t just about your idea. We found that there are indicators of success for entrepreneurs who are more likely to get a ‘yes’ from the sharks. As a viewer, it’s fun to watch for these cues. As a pitcher, it’s essential to know how to use these cues. 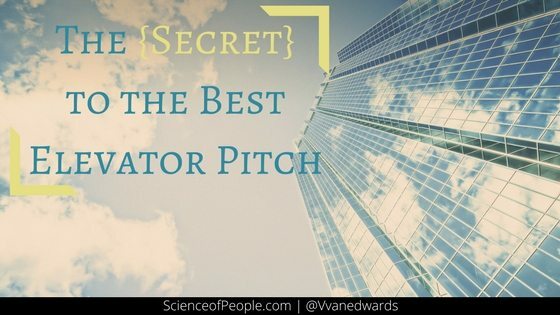 We break down exactly how each successful pitch showcased these characteristics and how you can use them too. 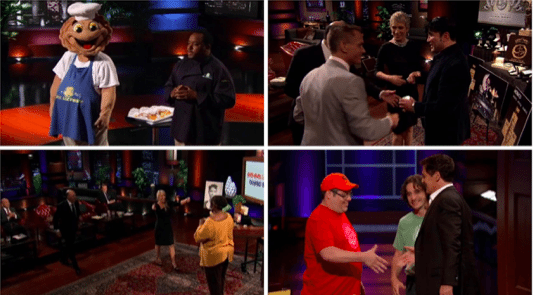 If you’re like me, you watch Shark Tank and try to guess which entrepreneurs are going to land a deal. Sometimes you are shocked to see who gets turned down and other times you feel like you knew from the moment they walked through the door. ZipZ (S6, Ep. 11) and Copa Di Vino (S2, Ep. 1) both pitched companies that produce single-serving cups of wine. 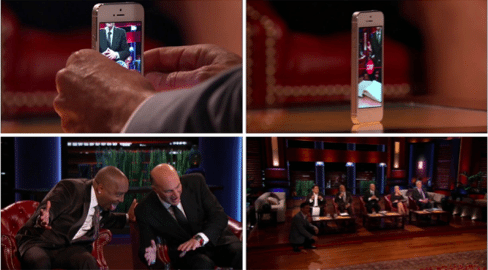 ZipZ’s founder made one of the biggest deals in Shark Tank history with Kevin O’Leary. Copa Di Vino pitched in the tank twice and never got a deal. Magic Moments (S5, Ep. 9) and Groove Book (S5, Ep. 13) are both services that turn your social media pictures into printed photos. Groove Book got multiple offers and made a deal with Mark Cuban and Kevin O’Leary—and was recently acquired by Shutterfly for 14.5 million! Magic Moments got no offers. Rufflebutts (S5, Ep. 5) and Squeeky Knees (S5, Ep. 19) are both children’s clothing companies that were pitched by parents. Rufflebutts got offers from multiple sharks and made a deal with Lori. Squeeky Knees got no offers. Wicked Good Cupcakes (S4, Ep. 22) and Blondie’s Cookies (S3, Ep. 11) are both baked goods companies run by women. Wicked Good Cupcakes got a deal, Blondie’s Cookies didn’t. These products were all strikingly similar, but had very different results. This all boils down to the pitch. How does each entrepreneur frame their product for the sharks? We examined each pitch to find the patterns. Our findings surprised us and busted some common myths about the tank. Kevin O’Leary is famous for warning entrepreneurs not to step out of the pitch session to call a loved one or discuss a deal. He often says, “Bad things happen when you leave the Shark Tank.” We found that O’Leary is wrong. Bottom Line: More successful pitchers stepped out of the tank—don’t be afraid to ask for more time. Most people think that crying makes you look weak or underprepared. Corcoran once told a sniffling female entrepreneur: “You got to give up this crying stuff, the minute a woman cries you are giving up your power.” However, crying didn’t seem to break a deal. A total of 29 entrepreneurs have cried in the tank. Surprisingly, more successful entrepreneurs have cried than unsuccessful ones. Bottom Line: While it is certainly not recommended, crying won’t kill your deal. We like to think that opposites attract, but actually the more similar an entrepreneur was to a shark, the more likely they were to get a deal. Some sharks would actually say something like “I see myself in you” or “You remind me of myself.” When you hear this—it’s a positive sign! Now that we have busted some myths, let’s look at the patterns we can learn from. 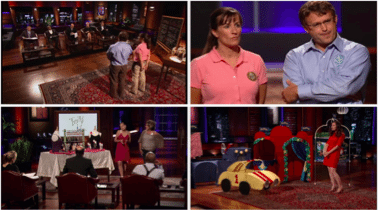 Note: We only see a small portion of an entire pitch on Shark Tank. So what we end up seeing in an episode is heavily edited. Obviously, we were only able to code what is actually shown on screen. Even though we were not able to see the entire pitch, we were still able to glean fascinating patterns—especially because every pitch shows the entrepreneur’s grand entrance and the first 30-seconds of their pitch. We relied heavily upon that area since it was shown in almost every pitch. Bottom Line: Appeal to the person you are pitching by showcasing your similarities. No matter how charismatic an entrepreneur was, if they didn’t know their math, had fuzzy numbers or asked for an unreasonable equity split then the deal was almost twice as likely to fail. 64% of ‘no’ deals had some kind of math problem. Only 32% of ‘yes’ deals had some kind of math problem. Bottom Line: Know your numbers! Math problems were such a deal breaker that we could only use pitches that didn’t have math problems for the rest of the data to see any patterns. If you don’t make it past this first tip, nothing else seems to matter! The entrepreneurs who smiled broadly and then nodded at the sharks before starting their pitch were much more likely to have a successful interaction. In fact, the smile and nod almost doubled the chances of getting a ‘yes’ no matter the combination. This is because a smile and nod is a very polite way of nonverbally signaling friend not foe. We like to work with friendly, agreeable people. This was an easy and immediate way an entrepreneur could show off warmth. 14% of ‘yes’ deals had the nod, while only 7% of ‘no’ deals had the nod. 45% of successful entrepreneurs smiled while walking in, only 21% of unsuccessful entrepreneurs did. The few entrepreneurs who both smiled and nodded were 9% more likely to get a deal. Bottom Line: Boost your first impression with a hello, smile and nod. Special Note: We also rated entrepreneurs on their smiling throughout the entire pitch on a 1 to 5 scale. We did this based on frequency and broadness of smiles. For example, fake smiles got a lower rating. Smiling throughout the pitch was only moderately helpful. ‘Yes’ deals had an average rating of 2.15 for their smile, while ‘no’ deals had an average rating of 1.75 for their smile—not a big enough difference to matter much, but still interesting! Bottom Line: Involve people in your pitch. Bottom Line: Get your investors to kiss. No, I am totally joking. Don’t do that. But do try to make your pitch interactive. Every shark loves a good story! Most of the successful pitches had some kind of story—either the entrepreneur’s personal story or the story of how the product was invented. Stories captivate our imagination. Research has found that as we listen to a story our brain actually syncs up with the storyteller. So if an entrepreneur tells a story about eating ice cream, the sharks’ brains light up as if they are eating ice cream. It’s a way that we bond with people. And successful pitchers wanted the sharks to feel bonded to their ideas so they would invest! Bottom Line: Share your story! The perfect example of this is the Bottle Breacher pitch in Season 6, Episode 8. He came with a military background and family story behind the idea…the Sharks ate it up! As we mentioned above, making yourself relatable can give you a helpful edge with a shark. The easiest way to do this was using your story to be captivating #4 and pointing out similarities with a shark. Some entrepreneurs actually said, “Like you Damon…” or “I did the same thing as you Mark…” This helped! Sharks like investing in people like them. Mark Cuban called 16-year-old founder Benjamin Stern “Mini Me” when he pitched his bottle-less bath company Nohbo in Season 7, Episode 19. Cuban gave him $100,000 in exchange for 25% equity. Mark Cuban and Barbara Corcoran have invested in exactly the same number of women: 31. However, Corcoran has a higher percentage—more of her deals are with women. Lori Greiner, despite saying she is the queen of investing in women actually invested in less women deals than Barbara. Additionally, the majority of her deals were with men. Bottom Line: Make you and your pitch relevant. We wondered if this would work in the Tank. If an entrepreneur adds a unique request or does something bizarre in their pitch—does it catch the shark’s attention? First of all, many entrepreneurs tried something unique (I am sure at the push of the producers—the Pique Technique makes great television). Bottom Line: Try something different to capture attention in your pitch! 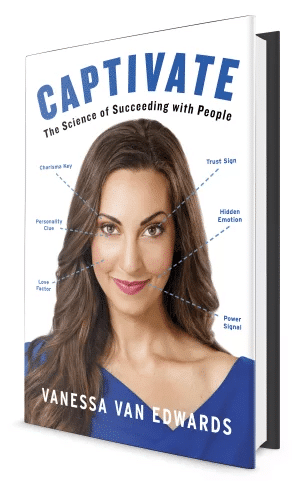 We wanted to know if successful entrepreneurs used confidence cues more. We typically signal confidence as humans with our posture and stance. So first, we rated each entrepreneur on their ‘power stance’ on a 1 to 5 scale. 1 was given to very low power posers—entrepreneurs who crossed their arms or stood in bad posture. 5 was given to entrepreneurs who took up a lot of space and who had a relaxed, upright posture. Bottom Line: Stand strong, stand calm. Humans also signal their self-assurance with their vocal power. We rated entrepreneur’s vocal power on a 1 to 5 scale. Entrepreneurs who got a 1 had higher-pitched, monotone or squeaky voices—showing high anxiety. 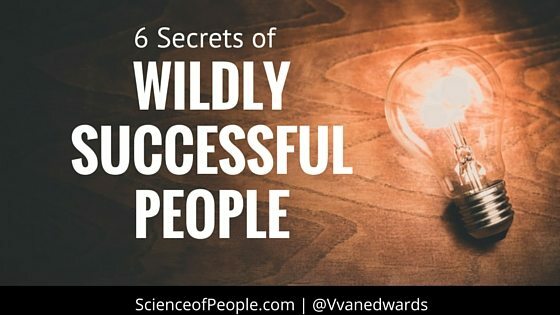 Entrepreneurs who got a 5 had a relaxed, consistent vocal tone without cracks or breaks. Vocal power is one of the hardest techniques we recommend in this report. We encourage our students to use breath to keep their voice nice and steady. 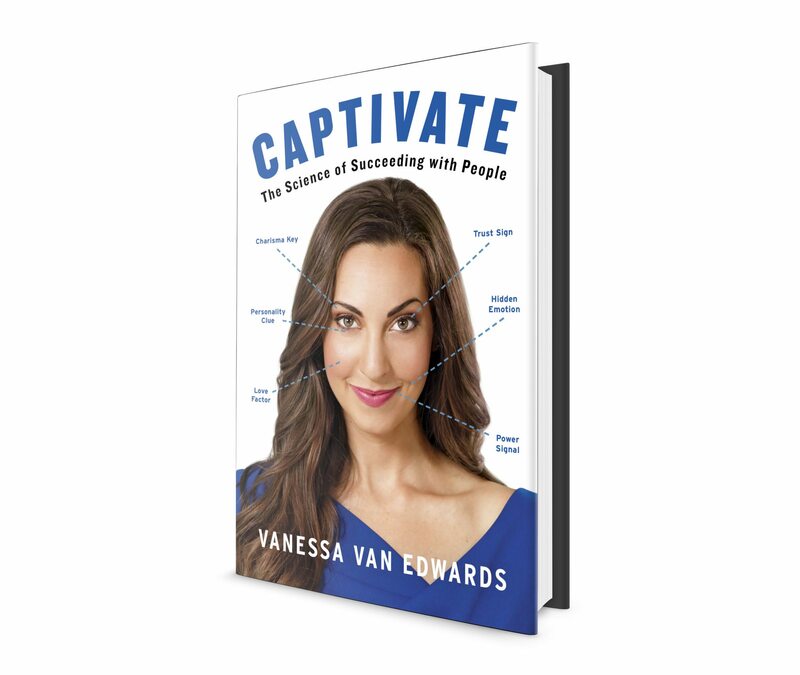 We noticed that when entrepreneurs got especially nervous in the tank, they ran out of air and their voice cracked. Before going into a pitch, practice it nice and slow with choreographed pauses—these pauses give you a chance to take a deep breath and slow down. Bottom Line: Speak slow, speak low. Broccoli Wad in Season 2, Episode 4 had celebrity spokesperson Vinny Pastore from the Sopranos who shared a flirtatious exchange with Corcoran. She eventually cut a deal with Vinny instead of the original founder of the idea. Corcoran had already stepped out but came back in after the deal was rearranged and a couple laughs were exchanged. Bottom Line: Bring in the humor to lighten the mood and boost your pitch. Mr. Todd of Mr. Todd’s Pie Factory in Season 1, Episode 1 is a great example of a hero’s journey. You can also check out Aldo Orta Jewelry (S2, Ep. 9), Mee Ma’s Louisiana Gumbo Brick (S4, Ep. 23) and the Tom + Chee (S4, Ep. 26) pitches. Bottom Line: Take people on your journey. We know from our research that entrepreneurs with math problems in their pitch are far less likely to get the deal. 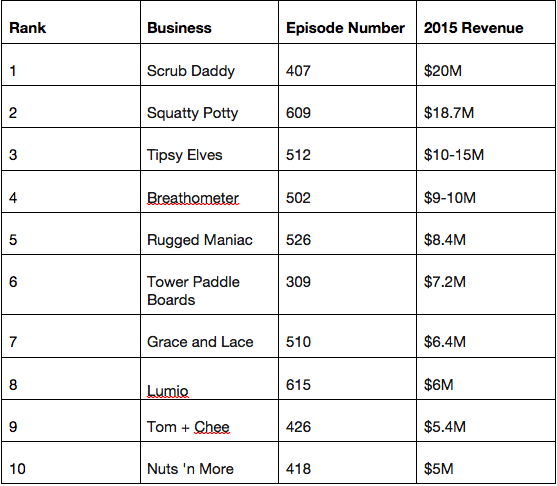 This shows that the most successful businesses after Shark Tank had clear and accurate math in their pitches. Entrepreneurs who smiled during their pitch make up half of the most successful businesses. We know that when entrepreneurs smile upon entrance to the Tank, they are more likely to get the deal. 81% of all successful deals had some kind of interaction and the top businesses were no exception. The majority of these pitches included some kind of interaction with the sharks. We found that most successful pitches included some kind of story—an experience or personal anecdote told by the entrepreneur. 30% of the best businesses told a captivating story in their pitch. A huge majority of the top businesses saw gender relevance in their pitch meaning the entrepreneur and the shark who made the deal were the same gender. The Pique Technique is when an entrepreneur includes something bizarre, unusual or unique in their pitch. We found that when an entrepreneur included some sort of ‘oddity,’ he or she was more likely to get the deal. And no exception for the top businesses—most used the Pique Technique in their original pitch. To gain trust and respect from the sharks, you gotta’ look the part! Almost every top business had a strong power stance during their pitch. Remember, to get the deal, stand strong. Entrepreneurs with a low, calm voice tone were more likely to get deals than their high, nervous voice tone counterparts. 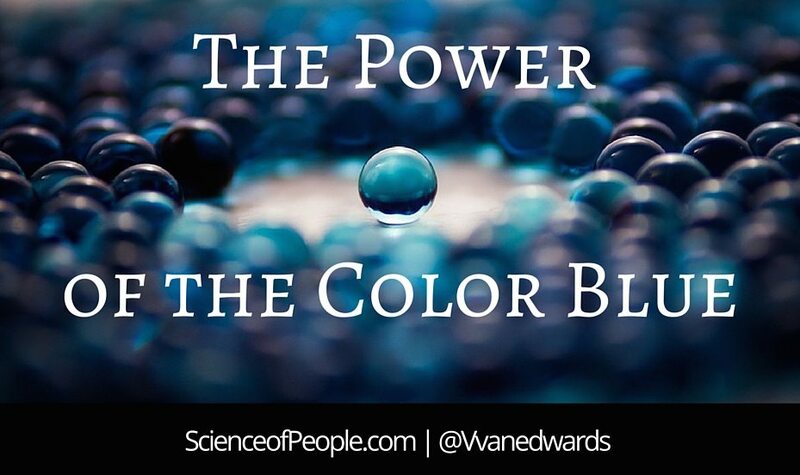 The same is true for our top businesses—80% had above average vocal power. Incorporating humor in a pitch can definitely play to the entrepreneur’s advantage. A little under half of the top businesses made sharks laugh during their initial pitch. Entrepreneurs who shared their story of idea to failure to growth often sparked the ears (and wallets) of the sharks. 20% of the top businesses shared their own hero’s journey during their pitch. Whether you are pitching a new business or sharing your elevator pitch, use the 10 pitch techniques we learned from Shark Tank to hook people in. *Be sure to read more about our coverage in these links! 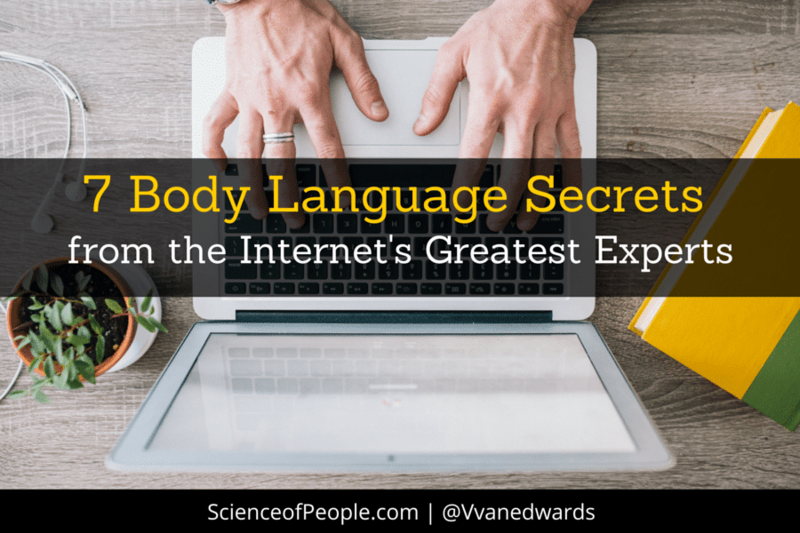 José Piña is one of our Science of People researchers and a certified Body Language Trainer. He likes the idea of combining solid research with modern examples to give you fresh, up to date tips and skills. All experiments are executed with the ambition to find out how and why do humans function and how the results can benefit you. Santos, Michael D., Craig Leve, and Anthony R. Pratkanis. “Hey Buddy, Can You Spare Seventeen Cents? Mindful Persuasion and the Pique Technique1.” J Appl Social Pyschol Journal of Applied Social Psychology 24.9 (1994): 755-64. Barraza, Jorge A., and Paul J. Zak. “Empathy toward Strangers Triggers Oxytocin Release and Subsequent Generosity.” Annals of the New York Academy of Sciences 1167.1 (2009): 182-89. Nudelman, Richard Feloni and Mike. “The ‘Shark Tank’ Investors Reveal Their Investing Secrets and Most Profitable Deals.” Business Insider. Business Insider, Inc, 16 Oct. 2015. Love, Roger. Roger Love’s Vocal Power: Speaking with Authority, Clarity and Conviction. Your Coach In A Box; Unabridged Edition, 2005. Print.